I recently wrote a blog about how to buy a new musical instrument (Where to buy…). I’m still fired up over the difficulty in getting a new instrument that plays well from the time you take it home. There are two problems I’ve I identified and want to write about more. The first is the problem of expectations some purchasers have for new instruments. The second is the difficulty of following my dad’s advice when buying a new instrument. First, my dad’s advice. My dad never actually gave me any advice regarding the purchase of a new guitar. He didn’t know anything about buying guitars. The advice he gave me was concerning how to buy a new suit or sports coat. I was in high school and getting ready for college. My dad, a university professor, said I had to have a nice sports coat for college. Until then, my suits and sports coats had been inexpensive, off-the-rack items. Who would want to pay for something better if it was being worn by a gangly, growing teenager and would be too small in a year? But college was different. This was a right of passage, an entrance to manhood and my dad was letting me in on the secrets men knew. His advice was fairly simple. 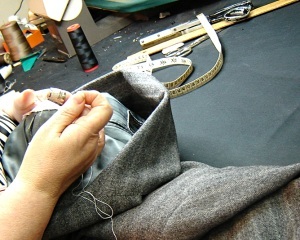 NEVER buy a suit or sports coat without having a tailor measure you and alter it so it fits your body. Don’t even think about buying menswear straight off the rack and taking it home. NOT EVER. NEVER buy a guitar, ukulele, mandolin or banjo off the wall of a music store (or over the internet) without first having it professionally setup. There’s just one problem with that advice. It’s the subject of my post on Where to buy… The problem is that the current way musical instruments are marketed and sold today make it very difficult for you the purchaser to comply with my advice. Before I go into my rant about why this is so, I’m going to review some new buyer expectations and how they can be unrealistic. These are things that a setup would have fixed. I’ve been reading the user reviews of new instruments on Musician’s Friend, Amazon, Music123, Sam Ash and other internet sites. It’s interesting for me to read less than glowing reviews. What are they complaining about? Are the complaints reasonable and justified? And how much musical experience do they have on the instrument they are buying? The first type of complaint I have to question deals with how well the instrument stays in tune. There are a fair number of reviewers who praise how well their new guitar stays in tune as if this is a pleasant surprise. However, there are many reviews where the instrument is given a lower rating because the reviewer claimed the tuners were not holding the pitch. Really? It’s not impossible that you have bad tuners. But it is unlikely. If there is a problem, it is more likely that the tuners need adjustment. If you have open, geared tuners then get a screwdriver and see if the screw that provides friction to the tuner needs tightening. If you have sealed tuners, there’s nothing you can do. But sealed tuners are more expensive and therefore less likely to have a problem. Friction tuners on cheap ukuleles often have problems. You can tighten these as well, but be careful not to strip the slot in the screw head. A setup could have fixed this problem. 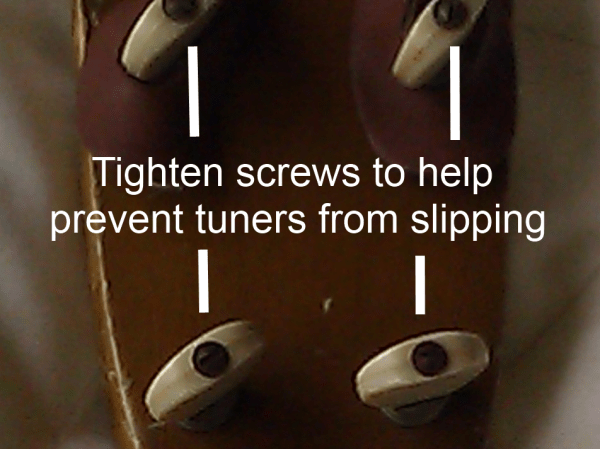 Below: Where to tighten tuner adjustment screws. Left image, mandolin. 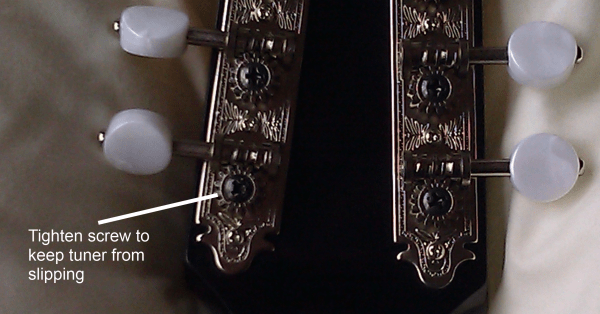 Right image, friction tuners on a soprano ukulele. New strings – they will stretch at first. This is partially dependent on how many times the string is wound around the tuning post. More wraps will cause the string to take longer to stretch although it might help hold the string afterward. One trick is to stretch the strings as you tune. Do this by pulling the string down where you pick. When the string has reached the desired pitch, stretch the string again and see if the tuning is now flat. Do this several times each time you tune up after putting on new strings and you should speed up the time it takes the strings to stay in pitch. Some strings are just stretchy and take a while to settle in (nylon strings). The method the string is attached to the post. There are numerous videos and how-to pages on the internet that explain how to put new strings on an instrument. Steel strings should be “locked” onto the tuning post – see pictures on how to do this. Also, the number of times the strings are wrapped around the post shouldn’t be too large. There should never be so many wraps that there are multiple layers. Strings can slip around the post if not attached properly. There is also a proper way to attach strings at the bridge. Look up online how to attach tie end strings (ukulele, classical guitar) or ball end strings to pin bridges. The nut could be binding so tuning adjustments aren’t fully transmitted to the main length of the string. A setup would fix this. Finally, changes in temperature and humidity will affect the tuning of your instrument. If it was cool and dry yesterday and today it’s hot and humid, you will need to adjust the tuning of most of your stringed instruments. Don’t blame your tuners if the cause is the weather. For wood body acoustic instruments, the top can shrink or swell which not only affects tuning but can affect the action of your instrument. The next complaint I read about in the online reviews of new instruments is buzzing. Why do strings buzz? It is rare for new instruments to have the action set too low, but it is theoretically possible. New instruments tend to be setup at the factory on the high side of acceptable just so they avoid buzzing problems. This is more common on inexpensive instruments. A setup would ensure the action is set properly. There may not be enough relief in the neck. If your instrument has an adjustable truss rod, the relief can be easily set by a technician during a setup. Some frets might be too high. Once other adjustments have been done, this is the most likely cause of buzzing. Buzzing can pop up as a problem on instruments that were previously buzz-free. Changes in temperature and humidity can cause frets to loosen or be forced up from the fingerboard. On well-played instruments, spots can be worn down by the strings causing uneven frets. Uneven frets can be filed down until the tops of all frets are even. Then the frets need to be rounded and smoothed. Free setups may not include this but I expect even frets on a new instrument. A setup can fix buzzing. Loose parts. Fret buzzing is common but other parts of your instrument can also work their way loose can cause annoying buzzing. Check to see if anything is loose. Yes, a technician would probably have done this if you had a setup. Intonation problems as you fret notes higher up the neck is a common complaint I’ve read in ukulele reviews. This may be a problem on the least expensive ukuleles but I expect that even on those instruments the real problem is something else. The most likely cause of intonation problems are old or “bad” strings. The easiest way to fix the problem is to put on a new set of strings. Another possibility for intonation problems, though I think rare, is you the player are causing the problem by pushing down too hard on the strings. The combination of guitar players buying ukuleles and some inexpensive ukuleles using large guitar-like frets can both contribute to this problem. If you are stretching the strings by holding them down to the fretboard, then the pitch will not be true. You can check for proper intonation at the 12th fret by first fretting the note there normally and then playing the harmonic above the 12th fret. Do this by lightly touching the string (not pressing the string) just above the fret (not above the space between frets where you normally fret a note). The pitch should be the same for both notes. If not, change your strings before considering other causes. I don’t believe even the cheapest mass produced instruments have improperly slotted frets. But it might be possible for the bridge to be positioned improperly. Unlikely but not impossible. Although a luthier can fix this, it is unlikely to be worth the cost on an inexpensive instrument. I can’t imagine this ever being a problem on more expensive instruments. Low action is rarely a complaint. If it causes problems it will be buzzing, covered above. I find few complaints of high action in user reviews. I believe the reason for this is most of the reviewers are inexperienced on the instrument they have purchased. They don’t have any set expectations of what the action should feel like. Consequently, I believe many are suffering through with higher action than they could have because they don’t know any better. Of course, a setup would get them off to a better start with the action adjusted properly. The reviews that do complain about action are often from more experienced musicians who go on to say that they either adjusted the string height themselves or took their new instrument in for a setup and now it plays great. In other words, experienced musicians expect a setup will improve the playability of their new instrument. One warning. Sometimes the neck angle is wrong and no amount of adjustment at the bridge can fix the problem. A neck reset is generally out of the question on a new instrument or any inexpensive instrument – too expensive. The good news is modern CNC construction (computer controlled) has made this problem rare. My expectation when buying a new instrument is it should work perfectly when I get it home. It’s NEW! I shouldn’t have to pay extra to have a new instrument tweaked so it plays, well, “like new.” However, I recognize that shipping and weather change, other people trying the same instrument out before I buy it and other things can cause this new instrument to need some help before it plays perfectly. The one item which might be controversial from the store owner and manufacturer’s point of view is admitting that one potential cause is the lack of care in constructing the instrument and lack of quality control to catch defects. Buying a new instrument is like gambling if you have to pay extra to get your instrument playing at its best. If you luck out and get a good instrument, you don’t have to pay extra. But you’re out of luck if you drew the instrument with bad action and uneven frets. This doesn’t seem fair to me. At least, in the past when almost all purchases were made in person at a local store, you could screen your instrument in the showroom before making a purchase to make sure everything was OK. One of the common recommendations to beginners in the past was to bring an experienced musician with you since you might not know what to look for. But so many purchases are made online now you don’t have the chance to pre-screen your purchase. Instead, you need to carefully screen the instrument during the period after you receive it when you can still return it for a refund or exchange. This is generally between 7 and 45 days. Take advantage of this time and return your instrument if it doesn’t play well. Buying at local stores is sometimes only marginally better than online these days. There is a huge amount of variability in the quality of a setup you can get at a local store. Some provide the absolute highest quality setups and service. But other stores may have a technician who visits on a weekly schedule and has minimum training for anything other than simple adjustments. It’s worth asking questions to find out if a setup is included in the price of a new instrument and what that includes. Some online and local stores have started charging for all setups, even on new instruments. I’ve seen a few who either offer a discount or charge a flat fee for a new instrument setup at the time of purchase. I don’t like this but it may be the only way to comply with my advice: Don’t bring home a new instrument without a setup. In spite of everything I’ve said above, even I have purchased instruments online and from local stores that give only cursory setups. Sometimes you see a deal too good to pass up. The question is, do you know what you’re in for? If you accept you may have to pay as much as another $100 for a setup (or even more), or are willing to do the work yourself, or are able to quickly evaluate your purchase and return it within the time limits provided if you’ve purchased online, then good luck and I wish you the best. Everyone else, you’ve been warned.